Looking at the alarming rate of deforestation, I feel our forefathers should have made all the trees and plants sacred. This is because people are scared to cut sacred trees. The sacred dimension of the tree is often represented by the tree growing on the top of the holy mountain, placed at the centre of the universe. Holy waters flow from the mountains nourishing the earth and all living beings, both physically and spiritually. Within the European tradition just as in the Indian, the trees, especially some species, have been regarded as sacred. Many pre-Christian rituals contemplated their worship. The Christian tradition also absorbed the concept of the Tree of Life in its most sacred symbol - the Cross of Christ. The forest near Chitrakoot in Madhya Pradesh is saved because it is associated with Ramayana. 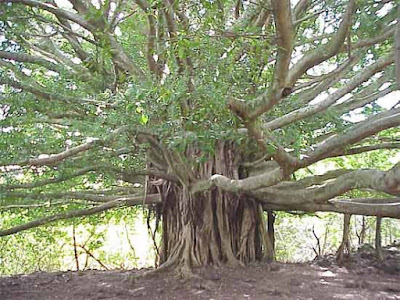 Peepal tree escapes the axe because it is associated with Buddha and Vishnu. Banyan tree is associated with Arjuna and is also worshipped in South India - the Bannimantap in Mysore. Khejri is venerated by the Bishnoi community of Rajasthan and Neem by the Gujjars. The medicinal properties of trees and plants in the forest are also well known. Devivana and Devarakadu are other places, under the control of the temples or forest department that contain sacred plants some of which have medicinal properties too. Navagrahahavana contains plants associated with each planet that is considered sacred. Such vanas help in biodiversity conservation as these are protected as sacred. A few tribal communities worship trees as manifestation of god. The survival of human beings depends on the survival of the forests.